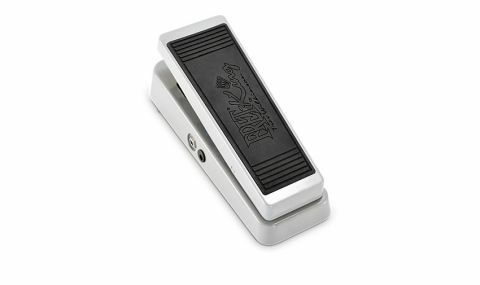 Old-school wah with a musical tonal range. Warm, smooth wah tones. LED. Battery access. We've seen many attempts at 'improving' the humble wah pedal over the years but those original 60s designs are still the tonal benchmark. Fret-King's Trevor Wilkinson owns one of the first Vox wah pedals ever produced and has based this new pedal on that oldie. "This is a pedal that retains the warmth of your tone while offering a smooth sweep"
He believes that a wah should be tuneful and not an exercise in seeing how much sweep you can get from one extreme of the treadle to the other - from muffled bass to piercing treble frequencies. He's also of the mind that much of the tone is down to a halo inductor in the circuitry and has therefore incorporated one here, resulting in a pedal that retains the warmth of your tone while offering a smooth sweep across the frequencies.